Shawl lapels on a jacket are normally seen on tuxedos that one would wear to a black-tie event or on a smoking jacket. 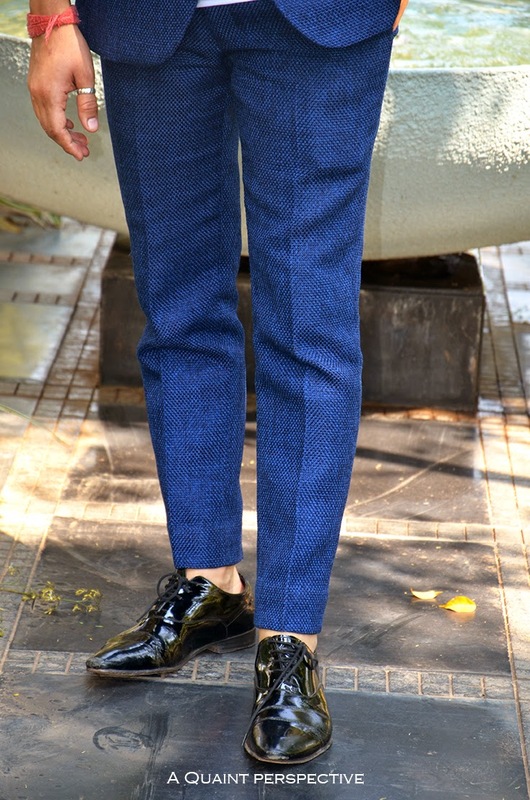 The dapper Armaan Randhawa shows us a way to wear it with a casual flair! Armaan is the designer and co founder of the label 'ARMAAN AIMAN' along with his partner Aiman Agha. Know more about their LIFW Spring Summer 14 presentation here. He wears his SB(single breast)suit with a plunge neck T in white. I think if a suit is well cut as is in this case you don't need more the a white undershirt to rock it! I love the color Royal Blue, the matte textured weave of the fabric and the contemporary fit, basically everything about it. The length of the trousers is perfect and just grazes his ankles. He keeps a neatly trimmed mo-beard with the so-now undercut hairstyle with a mild puffed top. A watch, a ring on his thumb and patent leather shoes in black finish off his casual-chic suited look with a shawl lapel.